Crap. I had to pave (reformat, start over, reimage, toss) my machine yesterday. After eighteen months of increasing Windows arthritis, it was getting unbearable. At one point I was unable to get on wireless and when I did, I couldn't browse. It was like the registry got the flesh-eating virus and it was moving fast. So, I imaged the drive ASAP (Thanks TrueImage!) and went to talk to Corillian IT. They formatted and re-ghosted my IBM T42 back to the default Corillian T42 Developer Image. I followed Omar's flattening tips, which were well-timed. The Office 2003 Save My Settings Wizard is pure gold and so few people know about it. You likely have this on your machine now, under Office 2003 Tools. 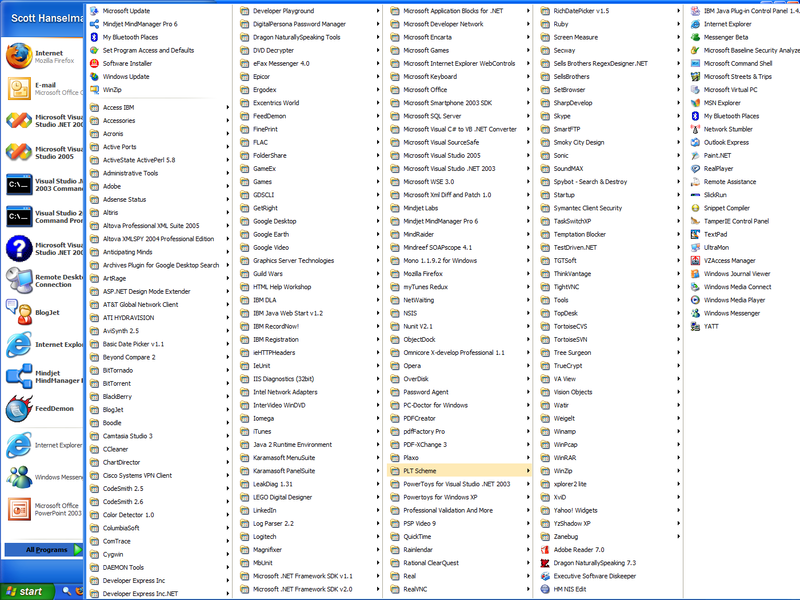 Eventually I'll add back everything in my Tools List, including all the add-ins and Explorer integration stuff I like, but first I needed to get my system back to a state that I call "marginally useful." Here's the things I installed yesterday before I found myself productive. Yes, I likely forgot something important, but these other tools will trickle back in as I realize I need them. 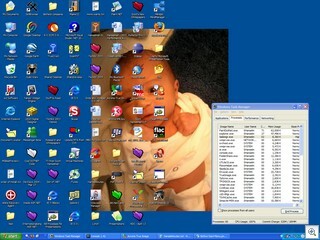 The images to the right there are my "Before" Desktop and Start Menu. Here's what I installed on my fresh "new" system before the machine was usable. Acronis TrueImage - Lets you mount a disk backup as another hard drive. Nice for cherry picking. Consolas (the Vista Command Prompt Font) and changed my command prompt to use Kermit Green on Black and 16 pt font. Plugins for GDS to index ZIP files, etc. del.icio.us integration with FireFox (This FireFox extension is brilliant. More on del.icio.us soon. At this point, my main system is pretty usable for day-to-day tasks. Eventually I'll get my tools back on in an on-demand fashion. Not bad. Elapsed time was about 3 hours from the restoring of the base Windows XP Pro OS image to this point. I did also leave the machine on over night to get my FolderShare shares re-synced. You probably will love this command line tool from Microsoft. I'm digging into it. A good free alternative to SmartFTP that is probably the fastest FTP utility and nicest and cleanest looking one I have ever used is Filezilla (not related to Gozilla in any way), just search for it on google. You may want to give it a look, its definitly worth the download IMHO! About how large are your Acronis image files for a complete disk backup? I assume there is some sort of compression. Looked around on their site a bit and couldn't get a sense of sizes. Product looks interesting to me because I just seem to have bad luck with hard drive failures and I'm tired of having to rebuild my machine once or twice a year. They are about the (size of the used space * .80). So, my 70gig main had 40 gigs used and I ended up with a 32gig file. TrueImage has several compression settings. I use the maximum and let it run overnight. Also if you use a very large drive, I would partition the drive and image each parition seperately instead of having one huge image. The reason is that I put stuff that seldom change in their own parition and image them less frequently and image the paritions that change frequently more often. I dump the images into my Maxtor external hard drive and *TURN IT OFF*. I used to put the images onto the external drive and leave it on. I got burned once when a malware wrote at random sectors across my drives including my Maxtor and ruined my OS including my image. I was able to restore some files from the image but it couldn't be used to restore the OS because the image file got corrupted. Now I turn the Maxtor on, image and turn it off before I use the computer again. I have seen cluttered desktops, but your's takes the cake. 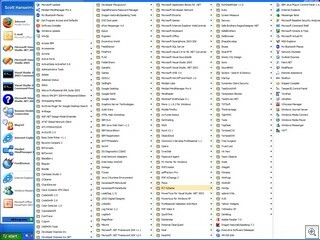 Shortcuts to 4 versions of IE, plus Firefox, plus Opera? How many different ways can your browse?